FLIR systems is one of the largest manufacturers of thermal imaging tools. However, if you are a homeowner looking for a simple tool for inspecting faults around the house, getting the FLIR E95 will be overkill. 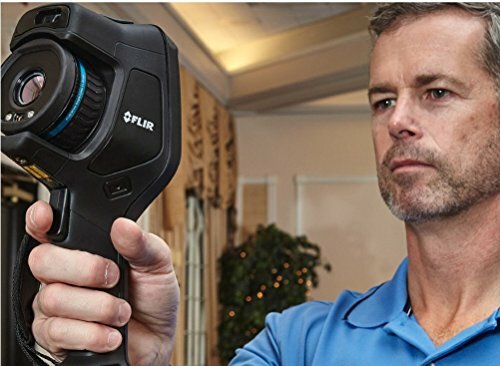 On the other hand, professionals looking to conduct audits on buildings and plants, or any other type of electrical or mechanical inspection will find the FLIR E95 to be a solid investment for their trade. 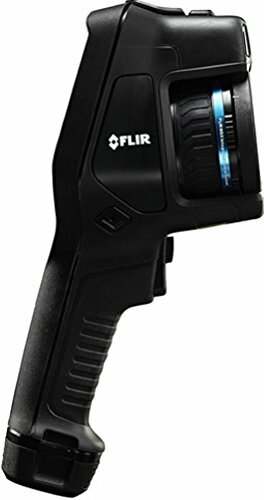 The FLIR E95 is an advanced thermal imaging camera that has been redesigned from the handle up for quality performance. It comes with a high-end 464 x 348 thermal resolution that delivers accurate temperature information. As part of the Exx-Series line of thermal imaging cameras from FLIR, the FLIR E95 boasts of having all the right features for a range of applications. From detecting subtle temperature differences to avoiding costly shutdowns caused by critical faults and deficiencies in a building, this thermal camera is a must-have tool for operations that require sensitive inspection. The FLIR E95 is evidence of the great advancements that have been made in thermal imaging so far. You can take advantage of this camera’s thermal fusion technology to blend every infrared image with a visible light image for clearly defined temperature data. Basically, the E95 captures a visible light image with its 5-megapixel camera and fuses it with a thermal image for visible details. In fact, the E95 delivers an enhanced image with sharper image-blending thanks to the fact that its camera is closer to the thermal detector. With the E95, you can use the laser distance meter to measure the distance to your target. This is an update from the previous version and it is a reliable feature when delivering the sharpest focus for your shots. You can also set the thermal imaging camera to a continuous auto-focus mode or have it set to the traditional manual focus mode or the one-shot contrast auto-focus depending on your needs. If you are looking for a thermal imaging camera that will allow you to identify hidden temperature data at high levels of sensitivity, the FLIR E95 is a solid choice. It features a 30mK thermal sensitivity which is sufficient for detecting subtle issues of hidden temperature data at home, in plants and other thermal sensitive environments. Combine that with the camera’s high IR resolution and you have yourself a thermal imaging camera that is capable of preventing shutdowns in any environment. Obviously, there is no uniform approach to every application. FLIR understands this and that is why the E95 features a modular and expandable interchangeable lens capacity that let you use 240, 420, and 140lenses. For the best image quality, these three lenses not only have the same profile but are also capable of auto-calibrating with the E95 making it easy to swap from one to the other while out in the field. The E95 makes it easy to record and report findings. First, the FLIR Ultra Max technology ensures that you get nothing less than super-resolution IR images that are enhanced up to 4 times for increased resolution. FLIR does it by capturing 15 additional images with every thermal image, therefore, combining all the images to make one huge image at a 928 x 696 resolution. Afterward, this image is stored on a new folder automatically and you can use the Wi-Fi connectivity of the E95 to upload the images in an instant. 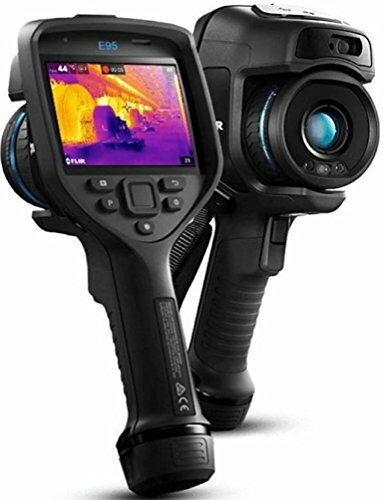 The FLIR E95 features a redesigned ergonomic body that is easier to operate than previous versions. 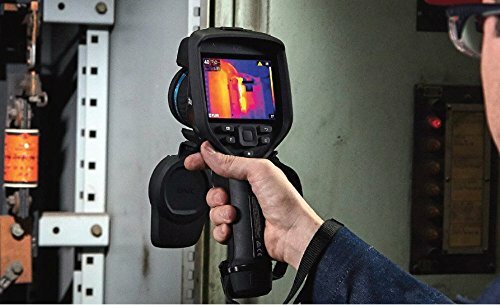 This thermal imaging camera comes with a 640 x 480 multi-touch display that is made with Dragontrail TM cover glass for scratch resistance and durability in tough environments. The screen also gets brighter than previous cameras in the Exx-Series making it much more reliable for different applications. The top it all off, the body of the E95 fits nicely with the handle grip that is both comfortable and easily portable. The E95 also comes with other useful features such as the capacity to measure moisture intrusion on the screen that gives the tool durability. There is also a built-in voice annotation that is great for ease of operation. It works well for measuring small differences in distant targets thanks to a superior spot-size performance that delivers accurate temperature data. There are a variety of areas where the E95 becomes super useful. First of all, there are two specific areas where the E95 is bound to be the most useful. These include mechanical or electrical application as well as building application. In building application, you can use it to find deficiencies and moisture penetration with clear data that is useful for damage control. After you have identified the problems in the building structure, you can use the E95 during building inspections as well as during insurance claim inspections. When it comes to electrical or mechanical applications, the E95 is beneficial as it can help in the diagnosis and reporting of sensitive electrical problems before the damage is realized. From identifying overheating joints and parts to locating water and heat leaks, the E95 is a must-have tool for both home and commercial inspection and technical tasks. At its core, the FLIR E95 is designed to prevent shutdowns and save money on expensive replacements. That is why the E95 features the best thermal sensitivity capacity not to mention an intuitive design that maximizes efficiency. In fact, its rugged design makes it a must-have for any working environment that requires regular inspections and with interchangeable lenses; you can use it for a variety of applications as well. If you are a DIYer at home, however, the E95 will be a bit too expensive for your needs. Professionals will, however, agree that the cost of the E95 easily pays for itself in terms of the costly damages this thermal imaging camera is able to identify in time.